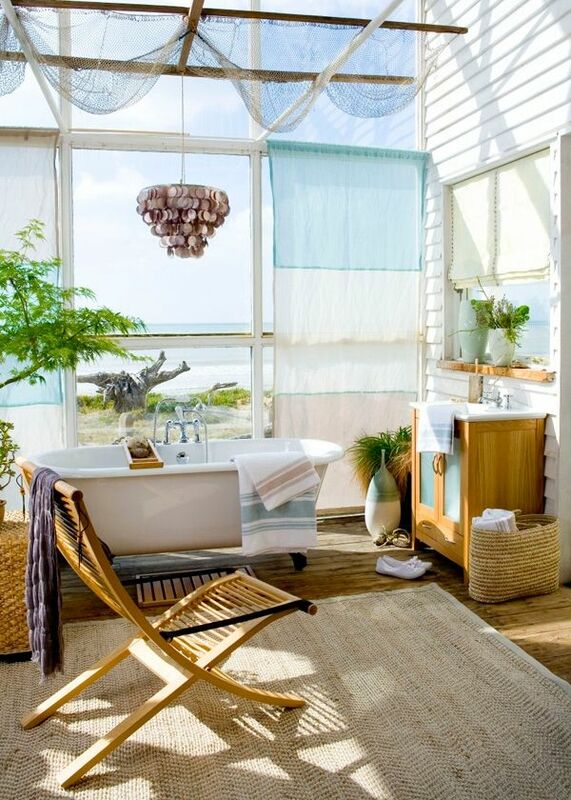 I cannot think of a better place to infuse the feeling of the tropics than in a bathroom. A place where you want to go to de-stress and relax. I don’t know about you, but I cannot think of a better place to relax than in a tropical destination. Of course we all know that unless you currently live somewhere dreamy we can’t all escape on a tropical vacation everyday, but we can help create a tropical escape at home. 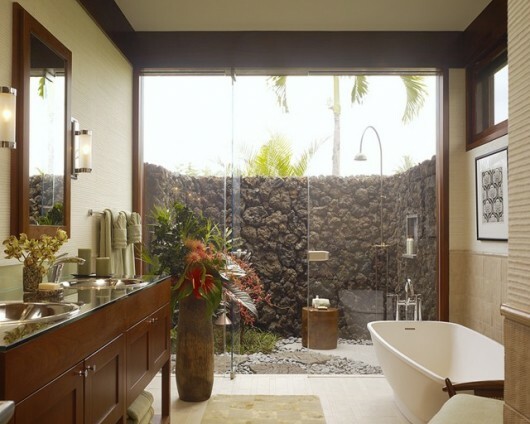 Here are some of the best tropical bathroom spaces I found around the web and how you can use bits and pieces from each to create a tropical retreat in your own home. This is the ultimate in a tropical getaway. Of course the dream would be to have an incredible outdoor space you could incorporate into your indoor space for a great indoor/outdoor bathroom. If you have the space to do this, but lack privacy then use a stone wall to create it and make your own outdoor room. You could put the tub outdoors (like you see here) or even have an outdoor shower. Don’t have all the space, mimic the look of the vanity and invest (by this we mean splurge) on fantastic lighting. Change out those mirrored closet doors we see so often for a pair of louvered doors to mimic the look of doors you see in the tropics (and above). 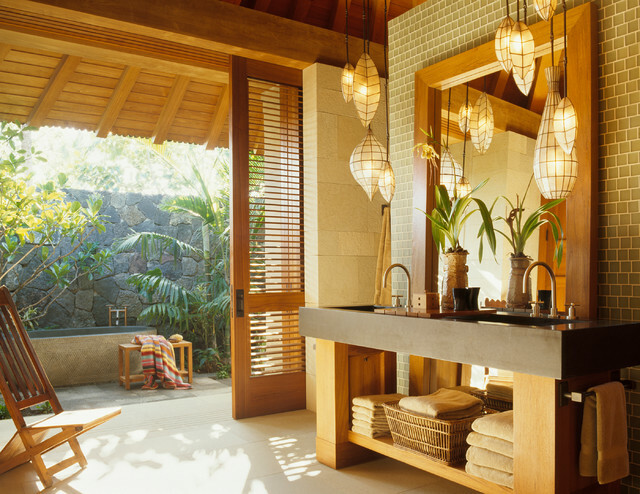 This is another great example of an indoor/outdoor bathroom. To achieve this look pay attention to the materials used. Loose stone on the floor set with stepping-stones to get to the shower can be done indoors or out. Add tropical plants and flowers to the space. If you do not have the ability to have the shower outdoors fake it. Use stone to line the walls of the shower and add natural stone and tile work to the flooring. Create the illusion of being outdoors without actually going outside. Add a skylight for natural light and it will actually feel more like you are showering in the sun. This is a great example of how to feel like you are in the topics in a smaller space. Use a rich wood tone on your vanity. You can even use bamboo cabinetry or an exotic wood with a rich decorative wood grain. Choose natural stone tiles in a neutral color so it mimics what you would see in nature. We love the use of the stone vessel sinks. Again, bring in tropical plants and flowers to really complete the look. 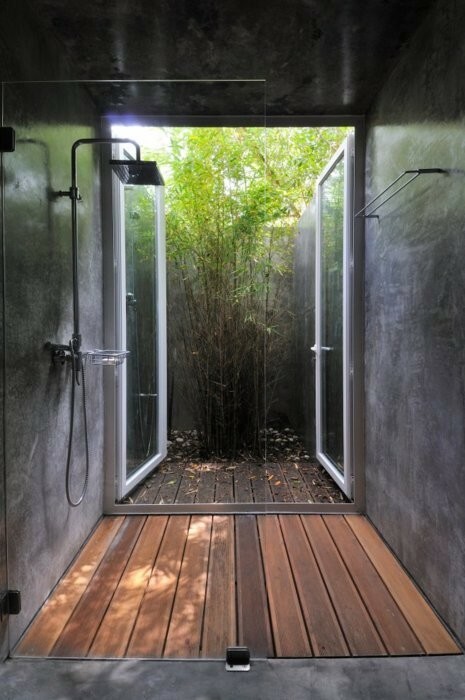 Here we find a great example of the indoor shower with an outdoor feel. 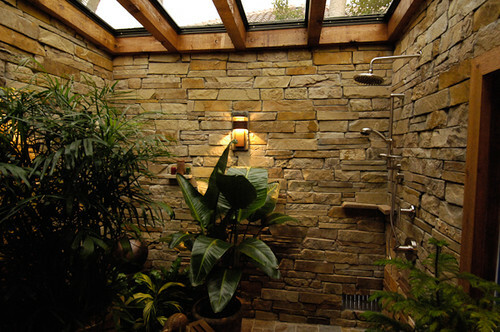 This fully uses the ideas we stated above to create the outdoor shower inside. We may not all want all those plant in the shower, but if you have space for some it would add to the feeling of being outdoors. The use of the skylight in the ceiling is a fantastic way to get daylight in. We chose this image for the outdoor space. I know we don’t all have bathrooms this large, but more often than not you do have a widow in your bathroom and this concept can be applied. You may not be able to take the entire (or even part of) your bathroom outside, but you can create a tropical oasis outside your window. This will give the illusion that you are in a tropical location when you look outside. This can be done by actually creating a tropical garden or you can even carefully arrange potted plants to give the desired effect. Do you live in a breezy location with a great view? Then this space is for you! Keep everything in pastel tones, light colors, and natural materials so as not to distract from your great view you already have. Use floor to ceiling windows and cover them with sheer, gauzy fabrics to create privacy but let the light still shine through. They will also look great blowing in the breeze. If you like things a little darker, then this example is for you. Choose a dark-colored stone that mimics the colors found in lava rock. Add a natural wood floor to you shower or at least use a wooden mat outside your shower. Accent the dark colors in the space with bright green bamboo. Plant it outside the space, at the window, or simply set potted bamboo plants inside the space. We chose this wonderful space for the flooring and the door. 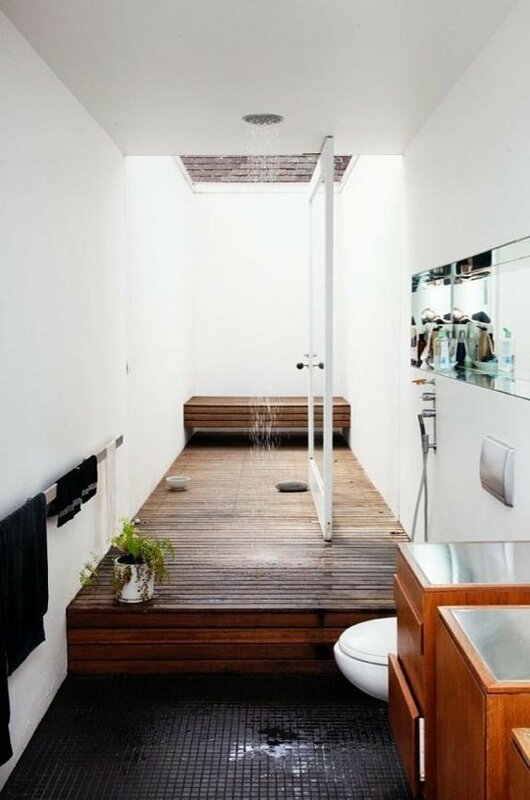 We absolutely love the use of the wood flooring for the shower space and the fact that the same material is carried outdoors to create a seamless transition between the indoor and outdoor space. The door that pivots in the middle creates the perfect opening to the outdoor space. This is a great way to add a path from a bathroom door to an outdoor shower. If you do not have the ability to do that or even make an outdoor shower use the right materials to get the look. Create an indoor planter in your space with tropical plants. Use a combination of dark tile for the shower floor and the borders of the bathroom and line the rest of the space with the wood slats. Instead of the traditional wall mounted towel racks hang towels from a bamboo ladder along the side of your wooden pathway. To get the illusion of the open shower without all the splashing indoors, tile one wall then use glass partitions for the other 3 shower walls. You will get the feeling of openness without the shower actually being open. The perfect solution for a smaller space. Lastly, we included this one just for fun. 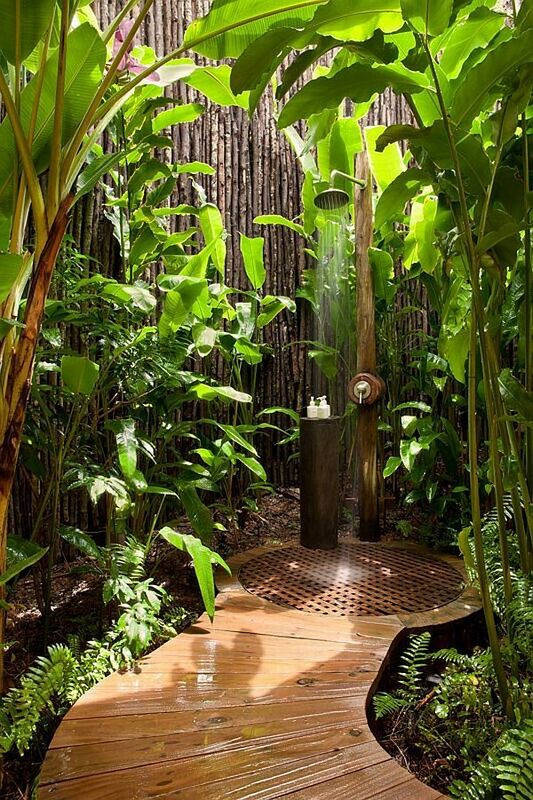 All the same ideas from the last outdoor shower apply with mimicking the wood pathway and adding the plants, but we just cold not resist this one last inspirational picture. Who wouldn’t want to take a shower here. 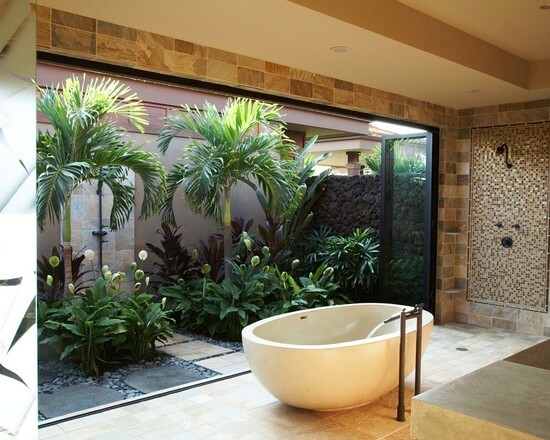 This would truly give you the feeling that you were showering in a tropical jungle. 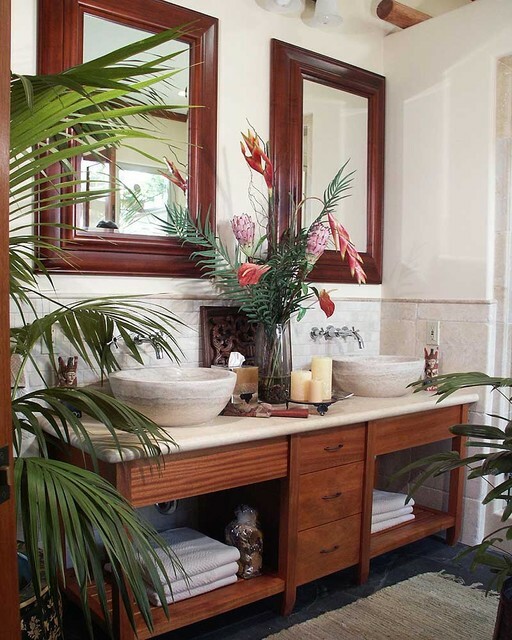 We hope this helped to give you some tropical inspiration to your space. I think it’s time to go redo a bathroom and if you are still stuck on what to do, don’t forget I can help with that. We can help design spaces in town and out-of-town no matter where you are located. Just contact us with any questions you may have!